Which Direction Should a Ceiling Fan Rotate? What is the correct ceiling fan direction during summer and winter? Is your ceiling fan on the proper seasonal rotation? It could save you energy dollars if it rotates in the proper direction depending on whether it is winter or summer. Ceiling fans provide great air circulation, and you can optimize these benefits by ensuring the ceiling fan rotation of the blades is correct for circulating warm air during winter or creating a breeze effect by moving or circulating the air better, during a hot summer. 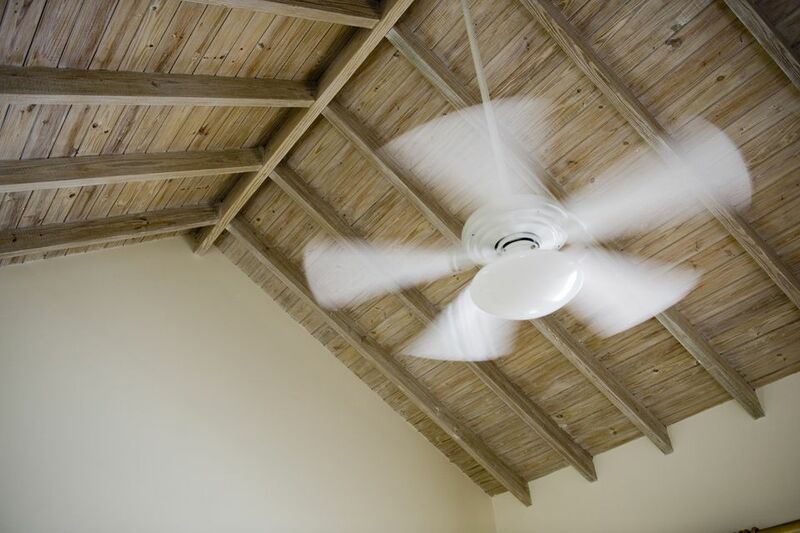 To help move warm air that is trapped on the ceiling, blades should turn 'forward' in a clockwise motion. This movement will push up the air and pull the warm trapped air down the sides of the room improving heat distribution. To help produce a comfortable breeze or 'windchill' that cools the skin, blades should rotate in a 'reverse' counter-clockwise motion. The air movement has the same comfortable effect as when you fan yourself with a magazine to get relief from hot, stifling air. Ceiling fans in themselves do not heat or cool a room, but the ceiling fan rotation allows improved air circulation, which can greatly improve the comfort of your living space. You can also save in energy costs when the ceiling fan is on the correct setting to support your cooling or heating efforts. Note: Though many ceiling fans sold in the US and Canada would follow this rotation guideline as per the test below, some models may have been designed overseas and might not be standard in this regard. For this reason, if you do not find your ceiling fan is working properly on the seasonal setting above, change it and note the difference. And there should be a noticeable difference. These summer/winter settings are provided as a guideline only to recommend that you explore settings on your fan to make it more efficient for each winter or summer. Six different fans were tested to conclude what rotation was best for winter or summer. All fans had the same blade angle and the two settings operated the same way. A reader in Japan also conducted the following physical test and we compared notes. His fan blades had the same angle and we came to the same conclusion. To further confirm proper fan seasonal rotation, we referred to information from one of the largest fan manufacturers, the Hunter Fan Company and came up with the same conclusion, based on their recommendation on how to destratify a warm room during winter. This site has the best information on buying and using ceiling fans. But in the absence of product information as to what setting is best for summer or winter for your particular fan, follow standard rotation recommendations for summer/winter, or conduct your own test. On the first or forward setting, explore where the air movement is detected, then make a reference note as a reminder for seasonal change. Then try the second or reverse setting. These are the optimum setting effects: in the summer, you want to feel the air circulating underneath and around the area reached by the fan. On a hot day, you would feel more comfortable and can detect air circulation on the right setting. In winter, as hot air rises, it becomes trapped at the ceiling level. On the correct winter setting, the fan should push air up and draw that hot air down the side walls of the room. You would feel practically no air movement underneath and only a little air circulation closer to the walls. During summer, this setting does not provide any comfort or enough air circulation to the room. But it does bring the hot air down to warm the cooler air closer to the floor.